Vivillon River in game: 1,880 Who? Important notice! Pokemon Vivillon River is a fictional character of humans. Vivillon (Japanese: ???? Viviyon) is a dual-type Bug/Flying Pokémon introduced in Generation VI. 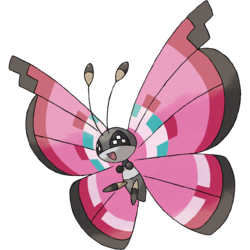 Vivillon is a butterfly-like Pokémon with wings that come in a large variety of patterns. 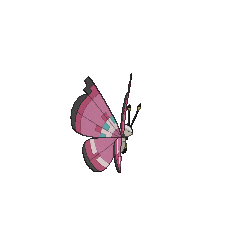 Vivillon's thorax is an elliptical shape divided into three segments, each with a different shade of gray. Its legs are also elliptical which are black on the lower half and grayish on the upper half. 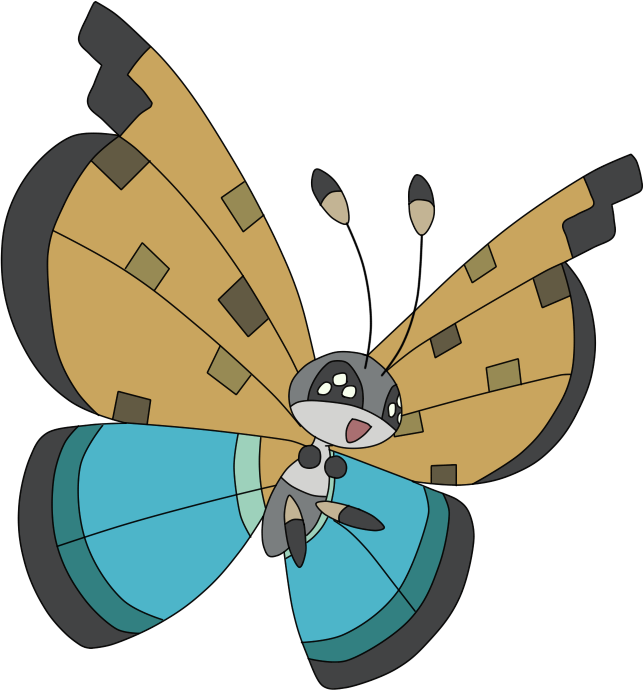 Vivillon has two black, circular hands and no visible arms. It has a round, grayish head with large, black, pixelated eyes and a pair of skinny antenna. It can spread its scales to calm an opponent's fighting spirit, as shown in the anime. Its wings' pattern is affected by the climate in which it lives. Vivillon is the only known Pokémon capable of learning Powder. 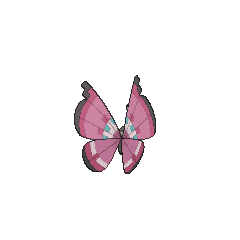 Vivillon made its debut appearance in its Meadow Pattern form in A Blustery Santalune Gym Battle!, under the ownership of Viola. The same Vivillon appeared in Battling on Thin Ice! and very much later in Rocking Kalos Defenses! and Forming a More Perfect Union!, battling against the Megalith. Multiple Vivillon appeared in To Catch a Pokémon Smuggler!. They debuted in their Continental, Elegant, Garden, Icy Snow, Savannah and Sun Pattern forms in this episode, evolving from a group of Spewpa. Multiple Meadow Pattern Vivillon appeared in Pikachu and the Pokémon Music Squad. A Meadow Pattern Vivillon appeared in Performing a Pathway to the Future! under the ownership of Aria. A Meadow Pattern Vivillon appeared in Battling With a Clean Slate!, under the ownership of Alvin. 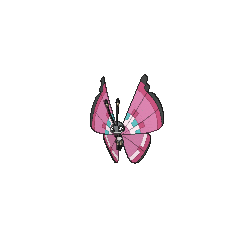 A Vivillon appeared in a flashback in Diancie — Princess of the Diamond Domain. 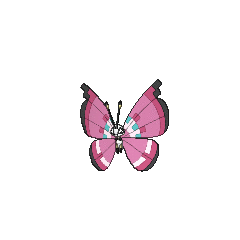 Multiple Vivillon appeared in Diancie and the Cocoon of Destruction. Two Meadow Pattern Vivillon appeared in A Full-Strength Battle Surprise!. Six Meadow Pattern appeared in Seeing the Forest for the Trees!, having all evolved from Spewpa. A Meadow Pattern Vivillon appeared in The Beauty Eternal. In Dancing Vivillon and Burning Fletchinder, fifteen Sky Trainers were hypnotized by Malva and used fifteen Vivillon, each with a different Pattern. The Vivillon Patterns which debuted were the Archipelago, Continental, Elegant, Garden, High Plains, Icy Snow, Jungle, Modern, Monsoon, Polar, River, Sandstorm, Savanna, Sun and Tundra Patterns. The leader of these Sky Trainers, Yvette, has mentioned that she has 18 of the Vivillon Patterns, including the Poké Ball and Fancy Patterns. After their defeat and no longer being hypnotized the Vivillon safely land the Sky Trainers down in Shooting Frogadier. Yvetter later uses a Marine Pattern Vivillon with her other Vivillon and in conjunction with Viola's Meadow Pattern Vivillon. Vivillon's effort value yield of 1 HP, 1 Special Attack and 1 Speed is unique. Viviyon may be a combination of ? bi (beauty), vivid, and papillon.